At the same time, U.S. refineries ran at their highest rates (93 percent capacity utilization) and produced the most they ever have for the month of January (17.3 mb/d). Moreover, domestic gasoline demand also was the greatest on record for the month of January (8.9 mb/d). These are terrific milestones. And crude oil production has been so strong, that its inventories rose by 1.8 percent in January from December and 6.7 percent compared with January 2018. Refined product inventories also were up more than 5 percent from January 2018, which was fantastic for consumers as gasoline prices, which averaged $2.34 per gallon in January per AAA, their lowest point since late 2016. But some interesting challenges also emerged. While much of the industry’s recent activity has been geared toward growing exports – the U.S. is now the world’s No. 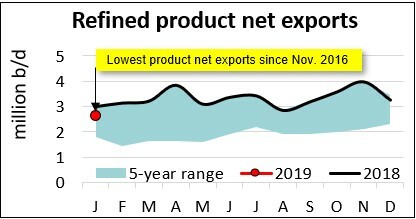 1 producer of natural gas and oil – those exports declined by nearly 0.6 mb/d over the past two months, due entirely to a drop in refined product exports. To put this in perspective, the U.S. was a net exporter of 4 mb/d of refined products in November, and this balance fell to 2.6 mb/d in January. That’s a 33 percent drop in global demand for U.S. refined products in two months – and the lowest U.S. refined product net exports since November 2016. Is this an anomaly or two months that suggest a trend? Well, the next insight we’ll offer is that a main index that tracks international shipping rates, the Baltic Dry Index, fell by more than 47 percent between the ends of December and January. One needs to go back to the depths of the Great Financial Crisis, in Q4 2008, to find a drop of similar magnitude. Together, the drops in refined product exports and international shipping rates suggest weakness in global oil demand and economic growth. This may not be a complete surprise given reports of economic weakness, especially in Emerging Asia. But it’s potentially important corroboration of what appear to be substantively weaker global trends that have been worsened by the fissures in global trade. U.S. trade policies have been a contributing factor to the slowing growth in Emerging Asia, and this in turn reverberates through the demand the prices for commodities. The critical factors to sustain the U.S. energy revolution are clear in the needs for access to markets, free trade and enabling investments and infrastructure to make it happen. Yet, the global economic warning signs have been increasingly clear that there’s a price to be paid for policies that impede or raise the cost of trade and investment.